TTN, 14th July 2015: It appears the sun is coming out for the tourism industry in a big way, best indicated by a phenomenal growth in jobs – accommodation and food services were up by 50,000 jobs in FY15/16, and recreation and arts added 40,000. With the Aussie dollar on its way back, economists are starting to see just how valuable our industry is. 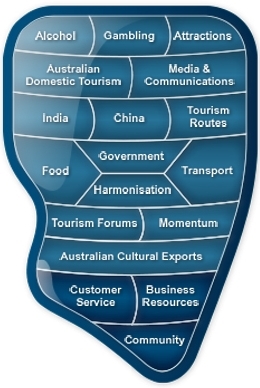 Tourism is incorporated into ‘household services’ in the Australian economy (accommodation and food services, education, health, recreation and other services). Economics editor for Fairfax, Ross Gittins, makes the point below that household services account for a third of total employment in Australia, and accommodation services have driven total jobs growth since the global financial crisis. Besides the dollar recovering, China’s visitation has tripled in the five years to 2015. In the 8 years struggling against the dollar (2008-2015), many tourism services have dropped out, with only the strongest surviving. The below two articles are by Ross Gittins, the economics editor for Fairfax. While we’re busy scaring ourselves silly imagining all the terrible consequences that may or may not flow from the turbulence in the eurozone and China, forgive me for intruding with some good news closer to home: unemployment has stopped rising. The employment figures we got from the Bureau of Statistics this week confirm – and so make a lot more believable – the amazing figures we got a month ago saying the official rate of unemployment had stabilised at 6 per cent. 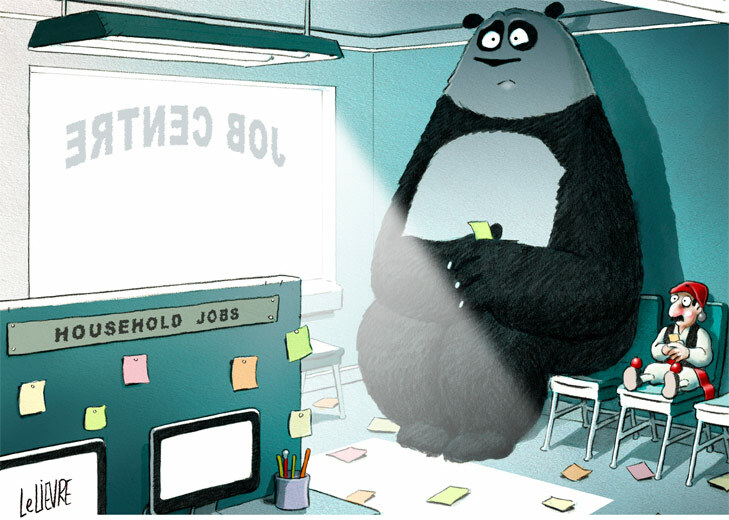 Barring some unexpected disaster, it’s now looking less likely the Reserve Bank’s forecast that unemployment will rise to 6.5 per cent by June next year will be realised. Let’s cut through the month-to-month volatility that so many in the markets and media love by sticking to the smoothed seasonally adjusted estimates known as the “trend” figures. They show that total employment grew by 215,000 over the year to June, an increase of 1.9 per cent. More than half these extra jobs were full-time. Since the labour force – all those people either in a job or actively seeking one – grew at about the same rate as employment, this was sufficient to get the rate of unemployment back down to where it was in June last year – 6 per cent. And this happened despite the rate of participation in the labour force – the proportion of population aged 15 or over who were either employed or unemployed – rising from 64.7 per cent to 64.8 per cent during the year. Not bad considering the retirement of the baby-boomer bulge is working to lower the participation rate. As I say, this is the same story the figures were telling us a month ago. So where have the extra jobs come from? Well, Kieran Davies, of Barclays bank, has used somewhat different figures – they say we had employment growth of 240,000 over the year to May – to tell us. He follows the Reserve Bank’s practice of splitting the economy into five broad sectors: household services (including accommodation and food services, education, health, recreation and other services), business services (information technology, media and communication, finance, real estate services, professional services and administrative services), goods (farming, mining, manufacturing, utilities and construction), distribution (retail and wholesale trade and transport and storage), and public administration. Davies found very strong jobs growth in household services of, in round figures, 180,000, with strength in healthcare (90,000), accommodation and food services (50,000), and recreation and arts (40,000). He makes the point that household services account for a third of total employment, and have driven total jobs growth since the global financial crisis. Business services, which account for almost a fifth of total employment, have been the next most important sector, with growth of about 80,000. This was driven by professional services, up 90,000, offset by falls in employment in other categories, such as real estate services (20,000) and finance (10,000), but small gains in other categories. Modest contributions to total jobs growth came from goods distribution (20,000) and public administration (10,000). Against this, however, there were job losses in mining (30,000), farming (30,000), manufacturing (5000) and utilities (5000), which more than offset jobs gains of 20,000 in construction. As you see, as well as this quite strong growth in employment overall, there’s been a change in the composition of employment, with relatively small contractions in various goods industries more than offset by big increases in service industries. If this news of strong overall employment growth comes as a shock to you, that’s hardly surprising. The economy’s been growing at below its “trend” (medium-term potential) growth rate of 3 per cent for a number of years. And it’s often repeated that the economy has to grow at its trend or potential rate of 3 per cent a year just to stop unemployment rising. (This 3 per cent rate of growth in the economy’s potential capacity to produce goods and services comes from labour force growth of 1.7 or 1.8 per cent a year, plus growth in the productivity of labour of 1.3 or 1.2 per cent a year). So, with real gross domestic product growing by just 2.3 per cent over the year to March (and needing to achieve an unlikely 0.8 per cent growth in the June quarter to achieved the Abbott government’s budget-time forecast of average growth of 2.5 per cent in 2014-15), how on earth is it possible for employment to be growing fast enough to hold unemployment steady? Well, one possibility is that the economy’s actually growing a lot faster than the national accounts say it is, but this doesn’t seem likely. A more likely explanation is that the economy’s potential rate of growth is no longer as high as 3 per cent a year. It’s more likely to have fallen to 2.75 per cent – or even 2.5 per cent, as some are suggesting. Why? Because slower growth in the population than we’ve had in recent years – slower than the econocrats were expecting – is causing slower growth in the labour force. Population growth is slower because fewer Kiwis are coming to Oz and more are going back home where, for the moment anyway, the economy’s prospects are brighter. As well, the end of the mining construction boom means fewer workers and their families are coming in under temporary 457 visas. If the economy’s potential growth rate is lower, that means we can stabilise unemployment at a lower rate of actual growth. In our present circumstances, employment growth is probably being encouraged by the lower dollar and the exceptionally slow growth in wage rates. Note that when the economy grows more slowly because the population is growing more slowly, we’re not left worse off in terms of growth in income per person. But lower immigration does make it easier to get on top of unemployment – something economists prefer not to mention. Did you know that when the value of our dollar falls, imports become dearer? When the Business Bible learnt this last week, it got so excited it led the paper with the news. Every smarty knows that the economic turmoil in Greece and China must spell bad news for us, so when the turmoil caused the Aussie dollar to fall below US75¢, this was obviously the start of the badness. Apparently, it means the “global purchasing power” of Australian households has fallen. Who knew? Immediately, our ever-vigilant media sprang into action to determine which purchases were likely to be more expensive. Don’t you love the way the media can find the downside in any piece of economic news? The fact that for months the nation’s macro-economists and many of our business people have had their tongues hanging out, thirsting after a lower exchange rate, was something no one considered worth mentioning. Nor that Reserve Bank governor Glenn Stevens’ wish to see the dollar fall to US75¢ had finally come true. It’s true that if you view the position solely from the perspective of consumers, a higher dollar is good news and a lower dollar is bad. However, from the perspective of Australia’s trade-exposed industries and their employees, it’s the other way around. A high dollar means you get fewer Aussie dollars for anything you export, whereas the imports you compete against in the local market are now cheaper than they were. So a higher dollar means Australian tradeable industries suffer a loss of international price competitiveness, which almost always leads to them reducing their production and their job opportunities. In other words, a higher dollar has a contractionary effect on economic activity (which at least has the advantage of reducing inflation pressure). And that’s been our story since the mining boom caused the Aussie to appreciate so strongly. However, with mineral commodity prices having been falling since mid-2011 and mining construction projects winding up since the end of 2012, the dollar finally began falling back; though, thanks to the advanced economies’ resort to “quantitative easing” (creating money), not by as much as the fall in commodity prices implied should happen. It follows that a lower dollar has an expansionary effect on economic activity. Since our exporters now get more Aussie cents for each US dollar they earn, they’re able to export more. And, since imports are now more expensive to their domestic customers, they’re able to recapture a larger share of the local market. The consequence is that our tradeable industries increase their production and the job opportunities they provide. 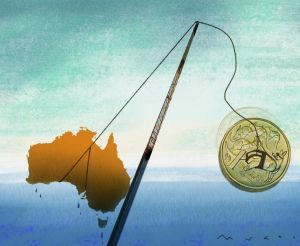 In our attempts to explain why relatively strong growth in employment – particularly since the start of this year – has caused the official unemployment rate to stay steady at 6 per cent, you’d have to give the lower dollar a fair bit of the credit. That’s particularly evident in the strong growth in employment in the services sector and in exports of services. Historically, services were regarded as non-tradeable, but globalisation and advances in transportation, telecommunications and digitisation are making that less true every year. The tradeable services sector’s improved price competitiveness comes at a time when Asia’s middle-class is growing in size and income, with its consumption preferences shifting towards Western goods, services and destinations. No service industry better demonstrates the lower dollar’s beneficial effect on production and jobs than tourism: an industry where import replacement is just as important as exporting. 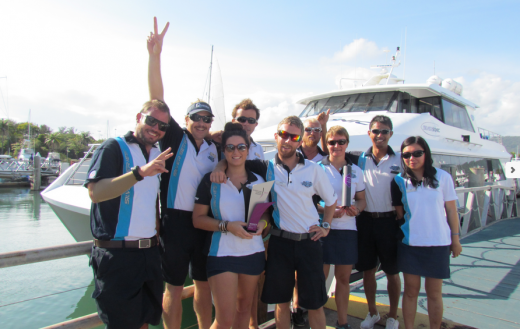 The lower dollar not only attracts more foreigner visitors, it encourages Australians to holiday at home rather than abroad. Estimates from Paul Bloxham, of HSBC bank, show spending on tourism accounts for about 3 per cent of gross domestic product, with about a third of this coming from foreign tourists. The industry employs more than 500,000 people. Overall, the value of tourism exports reached $14 billion in 2014, up 8 per cent. Tourist arrivals from China over the year to May were up 21 per cent on the previous year, Bloxham says. Chinese visits to Oz have increased to 920,000 over the past year, up from 370,000 five years ago. Turning to education exports, Bloxham says international student enrolments reached a new high of almost 147,000 at the start of this year. Last year, the value of education exports reached $17 billion, surpassing the previous record in 2009. And Joe Hockey has reminded us that the value of all services exports over the year to March was up 8 per cent, their fastest growth since 2007. So if the fallout from the present international turmoil involves further falls in the Aussie, don’t let anyone tell you it’s a bad thing.